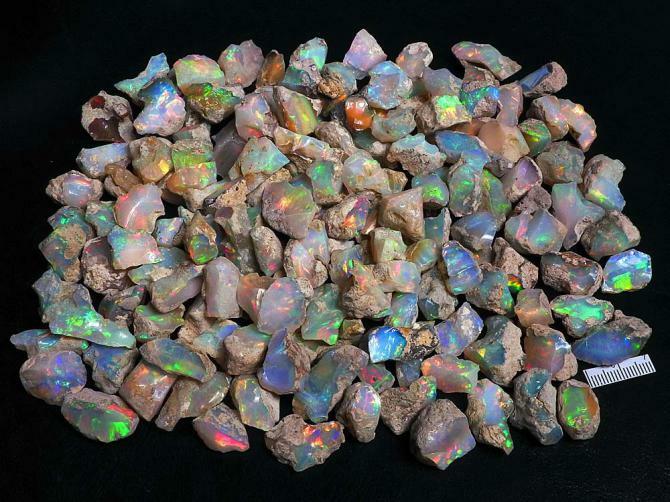 Extremely bright and colorful AA and AAA grade gemmy Welo opal in 1-3 gram (5-15 carat) sizes to cut small to medium sized Welo opal cabochons or carvings. Also great for inlay or doublets/triplets applications. The selection is for a 1 ounce parcel only. See another selection for discounted 2 ounce selection. The attached photo is of a random 320 gram sample from this rough Welo opal selection. Scale=20mm.